Welcome to Lincolnshire Waste Oil. 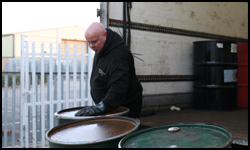 Lincolnshire Waste Oil is a family-owned waste oil collection company based in Lincoln. We provide a hazardous waste collection service to a wide range of customers from car garages to large factories and even ocean-going ships. We serve a large geographical area covering; Lincolnshire, Nottinghamshire, Leicestershire, Rutland, Norfolk, Cambridgeshire, Northamptonshire and Suffolk. We do also cover other areas by request. We provide our customers with bespoke waste collection packages that best suit them so they can get the best deal possible. Our customers enjoy a flexible and cost-effective waste collection service without the ties of a service contract. We responsibly collect and recycle waste lubricating oils into recovered fuel oil. Collections are completed in our specialist tankers. 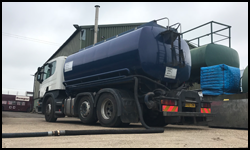 Find out more about tanker services. We also collect and recycle hazardous workshop wastes in our 7.5 Ton box vehicles. Find out more about workshop waste services. We provide a professional service from initial enquiry to after the collection has been made and the paperwork produced. We'll take you through every step. Solid-top drums (205Ltr Cap.) for liquid waste including waste oil, antifreeze, brake fluid, oily water, mixed fuels. Clip-Top drums for solid waste including oil filters, oily rags, paper wipes, grease cartridges, aerosols, contaminated granules. IBC (Intermediate Bulk Containers – 1,000Ltr Capacity) for waste oil, paint waste, oily water. Flo Tube Cases to securely store waste flo-tube lights. We do not charge for waste containers to be dropped off at your premises (excluding battery boxes & IBC's), all waste containers are suitably labelled and only charged for when waste is collected. 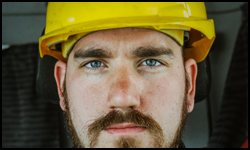 We are a fully licensed and insured waste collection company, visit our licensing page for copies of our insurance and license documentation.